It has been six months since HOV hours and tolls for solo drivers began on I-66 inside the Beltway, but what effect has that had on toll prices and trip times? WASHINGTON — Six months after expanded HOV hours and tolls for solo drivers on Interstate 66 began, new data shows mixed results for the system, with some trips slower now than the same time a year earlier. In April, average rush-hour travel time on I-66 inside the Beltway were slower eastbound between 8 a.m. and 9 a.m. than in April 2017. The slowdowns between 8 a.m. and 9 a.m. suggest the tolls may actually not be high enough to deter enough solo drivers to stay out of the lanes to keep traffic moving. Trips were faster at times outside of previous HOV hours, since fewer drivers are now allowed to use the lanes for free and slightly better than but largely the same as the previous year during the afternoon hours that HOV rules were in effect for before. Combining all four hours of the new rush hour period, VDOT said travel times improved both in the morning and afternoon. On the George Washington Parkway, traffic has increased dramatically compared to a year ago. After 7 a.m., the southbound lanes are slower than in the past, adding more than five minutes onto many commutes. Northbound in the afternoon, the slowdowns generally add a minute or two on average to northbound trips. Trips on U.S. 50 were slightly slower this April than last year, while trips on U.S. 29 were slightly faster at times in the morning but significantly slower over the entire afternoon rush. Speeds improved slightly on Va. 7, but have significantly slowed on the George Washington Parkway. Slowdowns are expected to get worse this summer due to construction on the parkway. On I-66, there could also be delays with construction ramping up on two toll lanes in each direction outside the Capital Beltway to Gainesville and a widening project inside the Beltway between the Dulles Connector Road and Ballston due to finish in 2020. There is a public meeting Tuesday night at Yorktown High School in Arlington to explain construction plans for the widening inside the Beltway. The project will also connect ramps at Va. 7 to create a direct exit from eastbound I-66 to the West Falls Church Metro Station. The work will include long-term nighttime lane closures. No lanes are scheduled to be closed during rush hours, but new concrete barriers and lane shifts will be in place for more than a year alongside the work zone. “I don’t want to say I’m happy, but I’m content. I think it’s working as we planned,” said Virginia Gov. Ralph Northam. The Virginia Department of Transportation is in the process of tweaking parts of the toll-setting algorithm, which could lower tolls at some times but could also maintain or increase prices at other times in an effort to keep buses and HOV users moving. The average eastbound speed in April bottomed out below 35 mph just after 8:30 a.m.
“There’s always tweaks that can be made and we certainly are sensitive to the tolls, we don’t want to put a burden on individuals any more than we have to, but what we need to do at the end of the day is move people, and that’s what the tolls were intended to do, and we feel that that’s working fairly well,” Northam said. A number of new bus routes and other commuter improvements are being funded through the toll revenue left over after paying for operations and maintenance, but Virginia has not yet provided data about the number of people moving through the I-66 corridor. About one in nine drivers are still using the road during the restricted hours without an E-ZPass, which exposes them to expensive violation notices in the mail according to newly released data from April. About 44 percent of drivers are riding free eastbound between 5:30 a.m. and 9:30 a.m. or westbound from 3 p.m. to 7 p.m. with an E-ZPass Flex switched to HOV mode to indicate they have at least one other person in the car. 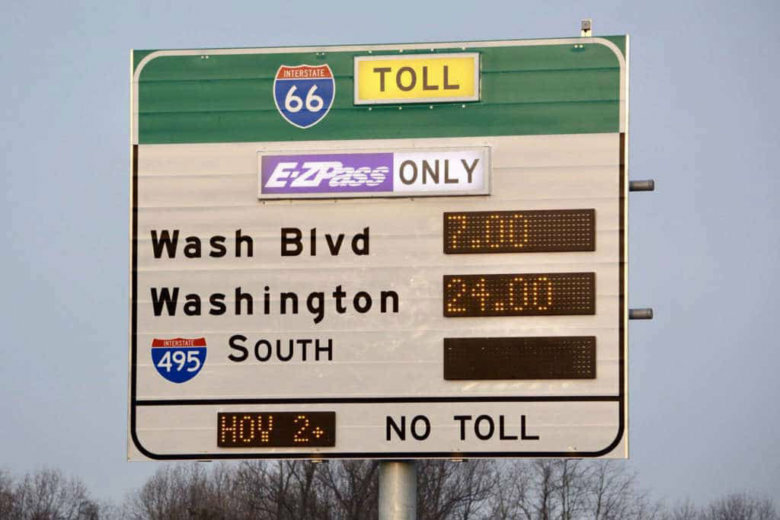 A similar percentage have either a regular E-ZPass or an E-ZPass Flex in toll mode to pay the toll that rises and falls based on the amount of traffic in the lanes. There have been no signs of significant increases in HOV use since the tolling began six months ago. Virginia hopes new park and rides and additional information about carpooling and slugging could change that over the next year. The average price paid for an eastbound toll in the morning when including trips on only segments of the road is $9.27. Before 6:30 a.m., VDOT said the average toll paid in April was $2.42. VDOT has not provided further breakdowns of the toll data requested by WTOP. In the afternoon, where drivers do not face a chokepoint at the Dulles Connector Road and traffic tends to be somewhat more spread out over the rush hour, the average toll paid in April was $4.86. The average toll prices have generally ticked higher since the tolls began. In April, 1,971 drivers out of 676,840 total paid $40 or more, VDOT said.